• Instructions with actual sized drawings. • Each hand stitched doll can be completed in about an hour. and acrylic paint & brush to complete this project. Materials needed to complete the doll: sharp scissors, needles and thread, tacky glue, toothpick, fine tip red and black markers in red and black, white or flesh color gel pen, or acrylic paints in red, black and white or flesh colors. 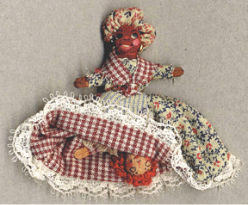 Rag dolls were made from scraps, no two are alike, none are perfect, and all are lopsided and flawed, so this can be a relaxing and enjoyable. As you work, think small and in a few hours the doll will be done!